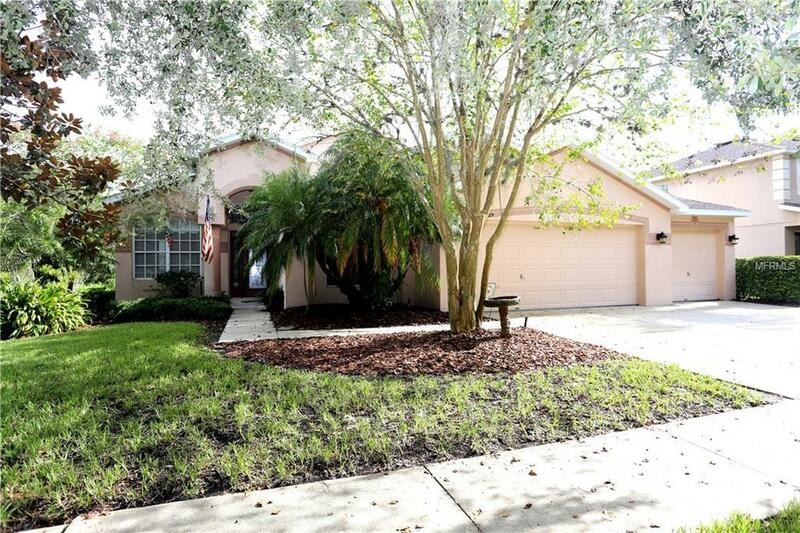 Ideal location in Fishhawk Ranch with pond and green space views. Large and spacious one story home with split bedroom plan. As you drive up to the home, you will be impressed with the location in the neighborhood. Only one neighbor to the east, pond views on back and side and trail view to the south. Kitchen and Family combination with kitchen island and views of pool and pond. Separate living room and dining rooms provide lots of entertaining spaces and still have an open feel. Laundry room includes newer front load deluxe washer and dryer. Caged Pool has great water views and a large covered lanai perfect for getting out of the sun for dining, TV game watching, anything. 4 bedrooms and 3 baths provide space for family or guests or both! 3 bay garage to store your autos. Fishhawk provides a wonderful lifestyle in Tampa. Many many community amenities are included as a resident. There are 3 tennis courts, basketball, 4 community resort-style pools, 4 gyms, game room, and dog park. With over 25 miles of trails, there is no reason not to enjoy outdoor Florida.